Trigger finger/thumb occurs when the pulley at the base of the finger becomes too thick and constricting around the tendon, making it hard for the tendon to move freely through the pulley. Sometimes the tendon develops a nodule (knot) or swelling of its lining. 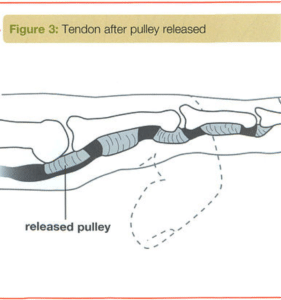 Because of the increased resistance to the gliding of the tendon through the pulley, one may feel pain, popping, or a catching feeling in the finger or thumb (see Figure 2). When the tendon catches, it produces inflammation and more swelling. This causes a vicious cycle of triggering, inflammation, and swelling. Sometimes the finger becomes stuck or locked, and is hard to straighten or bend (see Figure 2). Causes for this condition are not always clear. Some trigger fingers are associated with medical conditions such as rheumatoid arthritis, gout, and diabetes. Local trauma to the palm/base of the finger may be a factor on occasion, but in most cases there is not a clear cause. Signs and symptoms trigger finger/thumb may start with discomfort felt at the base of the finger or thumb, where they join the palm. This area is often tender to local pressure. A nodule may sometimes be found in this area. When the finger begins to trigger or lock, the patient may think the problem is at the middle knuckle of the finger or the tip knuckle of the thumb, since the tendon that is sticking is the one that moves these joints. The goal of treatment in trigger finger/thumb is to eliminate the catching or locking and allow full movement of the finger or thumb without discomfort. 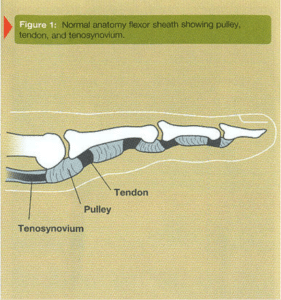 Swelling around the flexor tendon and tendon sheath must be reduced to allow smooth gliding of the tendon. The wearing of a splint or taking an oral anti-inflammatory medication may sometimes help. Treatment may also include changing activities to reduce swelling. 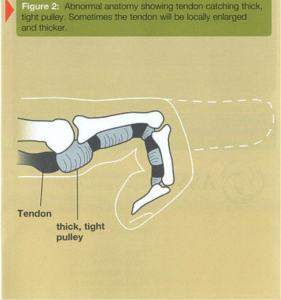 An injection of steroid into the area around the tendon and pulley is often effective in relieving the trigger finger/thumb. If non-surgical forms of treatment do not relieve the symptoms, surgery may be recommended. This surgery is performed as an outpatient, usually with simple local anesthesia. The goal of surgery is to open the pulley at the base of the finger so that the tendon can glide more freely. Active motion of the finger generally begins immediately after surgery. Normal use of the hand can usually be resumed once comfort permits. Some patients may feel tenderness, discomfort, and swelling about the area of their surgery longer than others. Occasionally, hand therapy is required after surgery to regain better use.